The mimic octopus is a new and exciting creature recently discovered off the coast of Indonesia. The mimic octopus, not to be confused with the Wunderpus photogenicus (distinguished by its fixed white markings), is the first cephalopod discovered to impersonate other dangerous sea creatures by altering its behavior, actions, and/or color. The mimic is very intelligent and is able to determine which dangerous creature to impersonate based on which will present the greatest threat to the current predator. However, being a newly discovered species, research is still preliminary and the number of organisms it can imitate is not yet known. Octopi have separate sexes. During reproduction, a male octopus inserts a hectocotylus (specialized arm), into the female and deposits packets of sperm into her mantle cavity. Shortly after this, the hectocylus falls off and in the months following this, the male will die. After fertilization, a female will lay eggs.The female mimic octopus will arrange the eggs into strings and carry them in her arms. When moving, the female will place the eggs in the arm crown and hold them with suckers. 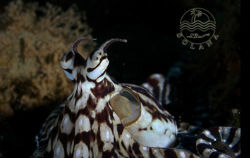 Unlike other octopi, the mimic octopus continues to feed after laying eggs. Near the time that the larva will hatch, the female will die. The hatched larvae will then become part of the plankton cloud and later return to the ocean bottom when it matures. The most fascinating thing about the mimic octopus is its ability to impersonate other animals. The environment that this octopus lives in is plain and therefore provides difficult conditions for the octopus to hide from predators. Instead of hiding, the octopus uses mimicry to defend itself from predators. While many octopi are known to change colors in order to camouflage themselves, none have been known to copy the behavior of other animals. This octopus is involved in active mimicry, meaning that the animal changes its behavior to match that of a species distasteful to predators. In this case, the mimic octopus changes its behavior to match that of predatorial animals. By doing so, the octopus appears to be a threat to its own predators. This defense mechanism is even more amazing, because the octopus can adapt its form to suit the perceived threat. For example, the mimic will behave as a sea snake to intimidate the damselfish whose predator is the sea snake. Sole fish: The sole fish is a flat and poisonous fish. The mimic will draw all of its arms together to form a leaf-shaped wedge and move forward using jet propulsion. Lion fish: The lion fish is a large predator with poisonous fins. The octopus mimics it by swimming with its arms spread wide and moving around the body near the sea floor. Sand Anemone: While not confirmed, it is assumed that the octopus imitate these sand anemones who are armed with stinging nematocysts. To copy them, the octopus sits on a sand mound and raises its arms in zig-zag shapes. Jellyfish: Although also not confirmed, it is believed that the mimic will swim towards the sea surface and float down with its arms waving around below it to impersonate the jellyfish. In addition, this octopus is believed to mimic the stingray, star fish, giant crabs, lionfish, seahorses, anemones, flounder, and mantis shrimp. However because the octopus has been newly discovered, research is still preliminary and more time is needed to observe the mimic. Aquarium Fish: Captive Observations of the Mimic Octopus, Thaumoctopus mimicus by Jay Hemdal. Advanced Aquarists's Online Magazine. Mimic Octopuses: Will we love them to death? By Dr. Roy Caldwell and Christopher D Shaw - Dr. James B. Wood, Editor. The Cephalopod Page. Mimic Octopus by several authors. Wikipedia, the free encyclopedia. Newfound Octopus Impersonates Fish, Snakes by John Roach. National Geographic News. Octopus, Anatomy Unknown author. Octopus.com. Dynamic Mimicry in an Indo-malayan Octopus by Mark D. Norman, Julian Finn, and Tom Treganza. The Royal Society. 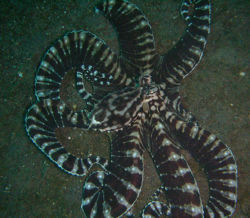 The "Mimic Octopus" (Thaumoctopus mimicus n. gen. et sp. ), a new octopus from the tropical Indo-West Pacific (Cephalopoda: Octopodidae) by Mark D. Norman and F.G. Hochberg. Molluscan Research. Screen Actor Octopus by unknown author. Creation Moments. This page was last modified on 26 July 2014, at 11:00.